As discussed back in 2006 on the Eggcorn Forum, it's not clear whether this is an eggcorn or a slip of the fingers — or just a novel expression that happens to be one character away from a cliché. The lapsus calami interpretation is plausible, since 'n' and 'h' are both touch-typed with the index finger of the right hand, and are also visually similar, making the result somewhat resistant to proofreading. At the same time, a "sigh of relief" is after all also a "sign of relief". After all of the talk of a government shutdown everyone has breathed a sign of relief since just a few minutes before the deadline the shutdown was avoided. Now that spring really is here, we can finally breathe a sign of relief that the spring market is matching the nice weather outdoors. Still, his parents breathed a sign of relief — their long nightmare was finally over, or so they thought. A tense Puttaparthy heaved a sign of relief 10 days after Satya Sai Baba was admitted at a super speciality hospital. The financial year is coming to an end, and India Inc is breathing a sign of relief. Israel and the world breathed a sign of relief when Egypt declared that it would honor its international commitments after the fall of Egyptian President Hosni Mubarak. Inter Milan must have breathed a sign of relief when they UEFA quarterfinal draw paired them with what was, on paper, the weakest remaining side in the Champions League. West Orange Firefighter and Local 28 President Angelo Tedesco expressed a sign of relief Monday morning as months of layoff and demotion negotiations ended. Karla Henderson, a group executive who oversees planning, breathed a sign of relief after the vote. Following the attack on Libya, Asian markets had heaved a sign of relief and Karachi bourse should have acted in concert..
Galvin, last seen correcting his flubbed release of incorrect census data earlier this week, can breathe a sign of relief in November, when, according to one Berkshire County lawmaker (Berk. Eagle), the redistricting process will be finished. Mimaki users will breathe a sign of relief to hear that the Japanese company has reported no damage to their facilities in Japan. Constant Alcorcon pressure for the remainder of the half, failed to find a way past a determined, well organised rearguard, who must have breathed a sign of relief when half time eventually arrived. Volunteer fire departments in the state are breathing a sign of relief after the legislature voted to provide $5 million towards workers compensation. That one involves the usual layers of attributional abduction — either Mr. Wurtzel really said "breathe a sign of relief" and Mr. Sulzberger transcribed it accurately; or Mr. Wurztel said "breathe a sigh of relief" and Mr. Sulzberger heard and remembered "… sign of relief"; or Mr. Wurztel said "… sigh of relief", and Mr. Sulzberger heard "… sigh of relief", but typed "… sign of relief". On two out of three stories, there's a genuine eggcorn in somebody's lexicon. NOW that President Obama has finally gotten his sweeping health overhaul passed, mutual fund managers can breathe a sign of relief. Finally, there is some certainty about the changes, and most of them appear to be beneficial for health care stocks. Nor is this a new thing. 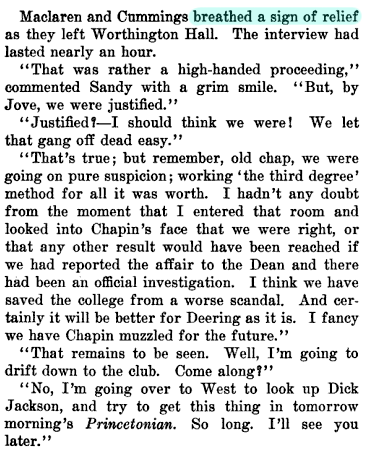 Consider this example from Latta Griswold, Deering at Princeton, Macmillan 1914: "Maclaren and Cummings breathed a sign of relief as they left Worthington Hall." The Badgers did mount a late rally. Trailing 35-24 at halftime, they missed their first 10 shots of the second half and didn't score until Mike Bruesewitz hit a jumper with 14:03 to play, making it a 42-27 game. Wisconsin head coach Bo Ryan threw his arms up in the air after that basket in a sign of relief. "Well, you would, too," Ryan said, when asked about the gesture. In that case, it's explicit that the "sign of relief" was not a sigh — but of course, a sigh can also be a sign. We usually think of eggcorns as starting with the perceptual re-interpretation of an expression that is acoustically ambiguous, like "reign in" for "rein in" or "feeble position" for "fetal position". Is it possible that this one involves re-interpretation of a natural typing error? When I type “breathe a sign of relief” into Google Search, it dutifully returns 102,000 instances, but it also asks whether I meant “breathe a sigh of relief”. It’s good to see that the Google Search engine is savvy enough not to suppose that a phrase with 102,000 instances on the web must be ok.
How bizarre: when I saw the headline I thought impatiently "Oh, for heaven's sake, it's just a typo"; I would never have dreamed it was so common a usage, nor that it was a century old! Excellent sleuthing, as always. I would think it's neither a typo, an eggcorn, nor (depending on what you meant) a novel expression. It's a deliberate pun: they are, after all, standing in front of several prominently placed signs. Tabloid newspapers and some magazines regularly engage in this sort of thing, as do some cable news shows, and of course The Daily Show — though more serious newspapers and network news shows rarely do. It's not, I should add, a very good pun. But I'm pretty sure it was deliberate. 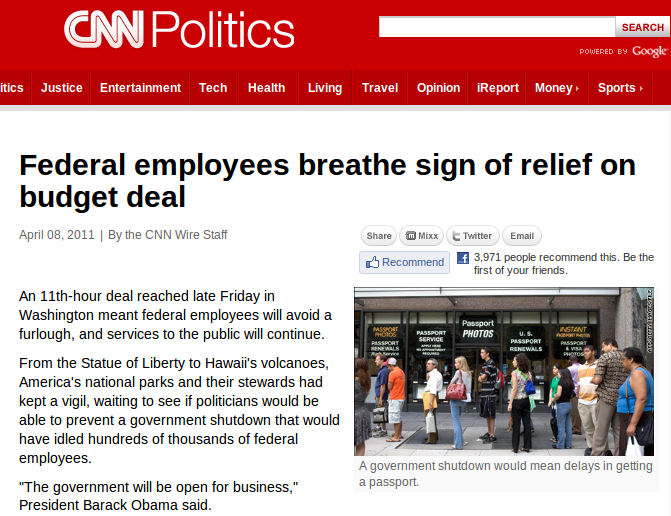 Maybe the word breathe is wrong, and the headline writer meant that the breath of federal employees is a sign of relief, having been bated all this while. If you type "breathe a sign of relief" into Google Books, the first hit is an outright pun: it's from the Complete Idiot's Guide to Acupuncture, in the title of a section about something called acu-points. Bad puns are a staple of headline writing, and that sometimes makes it hard to tell what was a mistake and what was intended. A sigh is just a sign? Actually, there are quite a few Google hits for just that that phrase as part of the lyrics of "As Time Goes By," a fact that would strengthen the typo hypothesis. I couldn't help noticing that the article also includes the phrase "would have grinded to a halt," and I was going to take that together with the headline as evidence of generally poor editing. But Google returns well over a million results for grinded, and it seems it is an authentic, although rare, alternative to ground. So once again I learned something unrelated to the point of the post. LL is a rich vein. Being in the UK, I can't see the Griswold text. Is it a photocopy or OCR? If the latter, the original may have "sigh" after all. "Their breath, a sign of relief." But "they breathed a sign of relief" breaks the logic camel's back. I think I'm going to start a consulting company named "Logic Camel". Sigh and sighn are incredibly common typos for sign for me, even when it's not of relief, and even when I'm handwriting. I guess there are so many -igh words that my fingers expect an h if I ask for another letter after -ig. I often find that my fingers have typed something not quite what my brain was thinking, without my brain noticing (not right away anyway). Often these are homophones, but I haven't really done a thorough study. Has anyone? I think there are at least a handful of idioms in English that are illogical if taken literally, due to mistakes that crept into the language. The only one I can think of at the moment is "head over heels," but I'm sure there are others. Does anyone have any other examples? "Have your cake and eat it too" originated as "Eat your cake and have it too." I've seen plenty of lame headline puns in my time, but this doesn't strike me as one. I'm betting on "perceptual re-interpretation of an expression that is acoustically ambiguous". "Sign" for "sigh" strikes me as no more of a stretch than "feeble" for "fetal". @Mr Fnortner – i don't know if you're right that 'Have your cake and eat it' actually originated as 'eat your cake and have it' (anyone got any evidence? ), but certain pedants do correct it to that – most notably the 'Unabomber', Ted Kaczynski, who habitually used the expression that way round, both in his acknowledged writings and in his 'manifesto'. It was one of the features of his writing that enabled Don Foster to identify him as its author – the moral being, I suppose: beware, your peeves will find you out. Several sources refer to the OED citation of John Heywood's "wolde ye bothe eate your cake, and haue your cake?" from his16th century book of proverbs. This might be a good start toward documentation. FWIW, When I first read the link and the headline, I didn't even notice the error. Me too, but when I did, I couldn't figure out what it's supposed to be for awhile, though, of course, I'm familiar with "sigh of relief". Regarding the eggcorn hypothesis, my first thought was, everybody knows what a sigh is and, after all, you can't breathe a sign, but then I realized that you can't really breathe a sigh either. In fact, I'm not sure what verbs can take "sigh" as an object. "Make a sigh" (25500 ghits, oddly enough, with "of relief" in the top hits), "create a sigh" (4510 ghits, but mostly in the "induce" sense, see below), and "produce a sigh" (4890 ghits, many in dictionary definitions of other words) all seem wrong to me. I think you can induce a sigh (9100 ghits), but that's all I can think of. I guess the ghits disagree with my intuition then. Trying to search google for "breathe a sigh" -"of relief" (and filtering out song titles) does return 159000 hits. Many of them seem to have elided the "of relief" part (or relief is modified by an adjective) and mean the same thing, but apparently you can also breathe a sigh of contentment, bliss, agony, fresh air (? ), release, longing aspiration, regret, indifference, frustration. Not sure how common any of those are in real life. granite26, you're apparently a very good reader. Reportedly, studies have shown that adults highly literate and fluent in a language often correct typos unconsciously as they read, enabling them to get the point quickly. It seems to me to fail the eggcorn test of making a certain twisted sense. I realize that some are trying to argue otherwise, but I'm finding their arguments unpersuasive. As a touch typist, I've often noticed that there is a second category of error I generate besides fat-fingeredly hitting the wrong key, and that is having my fingers produce the wrong word. This second type of error seems to involve a different part of the brain from the normal typo, in that it doesn't feel wrong, and I have to look to see the error. I'd describe it as a "thinko", but it's different from a normal thinko where I'm consciously thinking of the wrong word. Anyone else know what I'm talking about? I surely can't be the only one to experience this. Bottom line, this looks enough like an error to me that I'd want extraordinary evidence before accepting it as an eggcorn or coinage (an eggcoin?) or deliberate joke. I doubt it's a pun, for the simple reason that the folks in the picture aren't gov't. employees. Chris, yes, I believe I do know exactly what you're describing. When posting a correction for having made just such an error once, I recall signing off with an apology for my "braino". Well, I just Googled and found "braino" has been coined for sundry uses already, but as LL regulars, we know that alone needn't prevent us from attaching our own meaning, if it serves. Does it? I don't know what it's called, but if I understand you what you mean, I've experienced it. Especially with words the begin with st. I'll type the st, and then the wrong word follows, seemingly of it's own accord. It's a word I use frequently replacing a less frequent one. Continuing a familiar sequence instead of typing what one was thinking. I'd label it a typo, but I don't know what to call that particular type of typo. I still baffled by the resulting "breathe (a) sign" which outside of this particular phrase is completely incomprehensible. Although this hasn't stopped any other idioms from taking hold in the language.